A lot of people think of an elevator pitch as strictly a verbal introduction but really, it’s your introduction to the world. It can be spoken, written, or used in your social media bio. On this episode, I’m sharing a simple four-step elevator pitch equation you can use to land the deal. 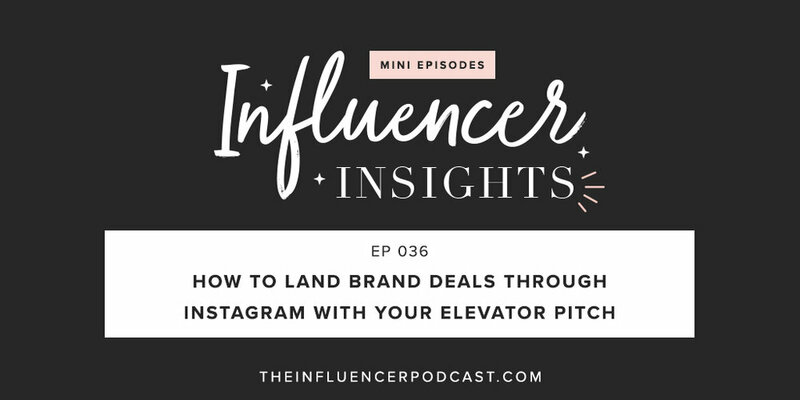 In this episode, you’ll learn step-by-step how to craft an effective elevator pitch that engages new followers and lands high-paying brand deals. I also share examples of elevator pitches that do and don’t work. By the end of this episode, you’ll be ready to write your own pitch. How do you use your bio to land brand deals? What have you found works well (or doesn’t work at all)? Head over to Instagram and tag me to share your tips! P.S. If you want to dive deeper into landing high-paying brand deals with your elevator pitch, check out Pitch It Perfect, where I teach you how to streamline your pitch for in-person networking events so you can *wow* people on the spot! Want to stay up-to-date on the latest episodes and strategies? Subscribe in iTunes and you’ll be the first to know when new episodes drop. If you want to be featured on the show as a reviewer of the week, I’d be oh-so-happy to hear from you. Click here to leave a review.